As North Carolina’s third oldest town, Beaufort traces its unspoiled historic past to Indians, whalers, privateers and, more recently, to sports fishing and vacationing. With over 100 beautifully restored historic private homes located along peaceful tree-lined streets and along the waterfront, Beaufort has maintained its wonderful charm over the centuries. Our bed and breakfast in Beaufort NC is proud to be part of the charming experience this coastal outer banks village has to offer. The Rachel Carson National Estuarine Sanctuary is located across the waterfront from Beaufort and is home to over 100 different species of wild birds and a small herd of feral ponies. 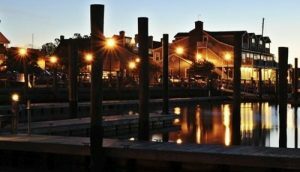 The Pecan Tree Inn is located one-half block from the Beaufort waterfront and is only a short walk to fine restaurants, shops, the Maritime Museum, the historical Restoration Grounds and ferries to Rachel Carson Sanctuary and Shackelford Banks. As of January 8, 2018 From Eastbound U.S. 70: Exit at 101 Turn right onto 101 east right on Live Oaks then right on Ann Stree left on Queen Street the Inn is a half block down across from Blue Moon Bistro and Beaufort Grocery Co. the driveway is on the left just before the Inn. From Ocracoke-Cedar Island Ferry: Take U.S. 70 west to Beaufort (45 minutes to an hour). You will be coming in on Live Oak Street. At the traffic light just past No Name Pizza, cross Cedar Street. Stay on Live Oak two more blocks and turn right on Ann Street. Drive three blocks and turn left on Queen Street. The Pecan Tree Inn is in the middle of the block on your left. The parking lot is just before the Inn.